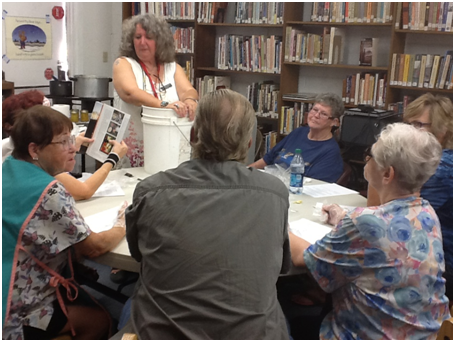 In honor of National Food Preservation Month in September the Kearny Public Library hosted a demonstration on canning, storage, pickling, and drying techniques with each person present getting “hands on” experience. 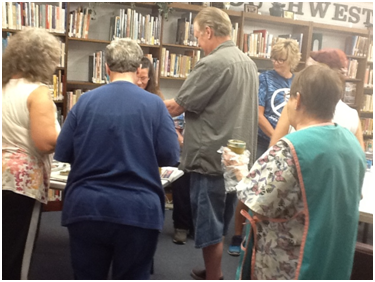 Each person got to take home their own jar of cactus jelly and watermelon rind pickles! 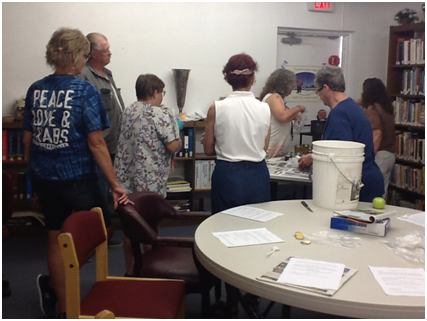 Attendees were each allowed to pack their own jars. 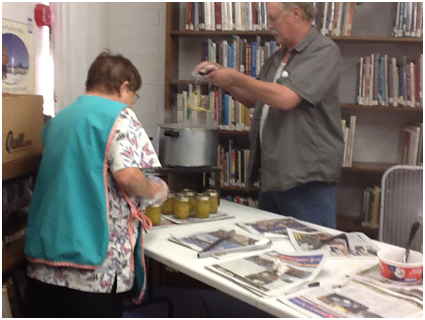 Beverly Servant & Jim McDaniels lift their jars of watermelon rind pickles out of the canner. Learning how to store apples, potatoes, root crops and onions in a 5 gallon bucket filled with sand for some “indoor” root cellaring. 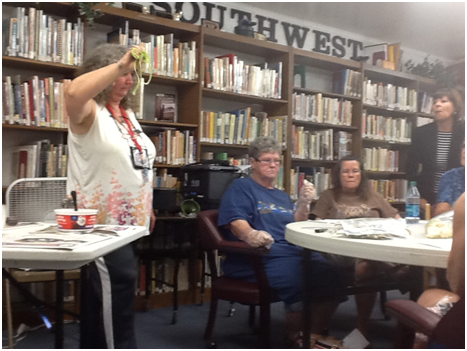 Demonstration of an apple peeler/corer, and how to use the peels and cores to make vinegar. 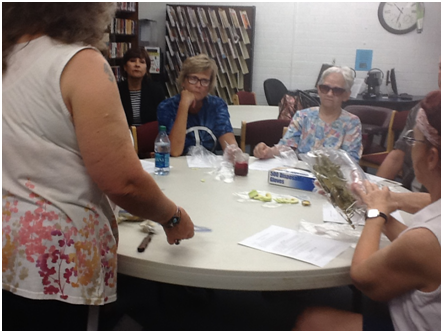 Different methods of drying produce were discussed with home, freeze dried green chili’s (in Lee Etta’s hand), as well as dried apples and potatoes, both freeze dried and dried in a dehydrator. L-R Janet Danilow, Town Manager Anna Flores, Vickie Lechuga, Mary King and Lee Etta Mitchell. How to pick and juice Cactus fruit using tongs using an apple for demonstration purposes. Select a firm melon with a thick rind. Peel green skin and remove pink melon leaving only white inner rind. Cut into uniform cubes or slices. Soak overnight in cold water in the refrigerator. Next morning boil in same water 10 minutes; and drain. Meanwhile boil vinegar, sugar and spices, tied loosely in cheesecloth, to a thick syrup. Drop rind into syrup and cook until clear. Pack hot into hot canning jars, seal by boiling in hot water bath for 5 minutes. Remove from water and set jars on a folded towel to cool. Let set two weeks to pickle before serving. The differences between agar agar and gelatin. Agar agar has several advantages over the traditional gelatin, namely: •It is derived from a plant source rather than an animal source, meaning that it is suitable for vegetarian and vegan diets, and also for diets with restrictions for moral, ethical, and religious reasons. It has no taste, no odor and no color. It sets more firmly than gelatin. Agar agar is able to set at room temperature; it also stays in jelly form even as the temperature rises. Agar agar gives a sensation of feeling full, which can aid dieting. It is used as a digestive aid by some people, to ease stomach upsets. Dissolve 1½ tablespoon of agar agar in ½ cup of hot water; this may need up to 10 minutes. Simmer for one to five minutes for powder and 10-15 minutes for flakes. Mix well with warmed ingredients. Put aside to set. As the ingredients cool, the agar agar will set. 1 quart of prickly pear cactus fruit should make about 2 1/2 cups of juice. Pluck the fruit from the cactus with a long-handled fork or tongs. Wash under running water in a colander to clean. I don’t even mess with the spines, I simply fill up my food processor or blender with the fruit and I add ½-1 cups apple juice and process or blend using a wooden spoon to push fruit down until it becomes a slush. Now tie in a clean old pillow case or cheese cloth and hang above a bowl overnight to collect the juice. Throw out the pulp. For clear jelly, do not use the portion containing sediment. In a saucepan, measure out 2 1/2 cups of cactus juice; add 1 package of powdered pectin. Bring mixture to a fast boil, stirring constantly. Add lemon or lime juice and sugar. Bring to a hard boil (one that cannot be stirred down with a spoon) and let boil for 3 more minutes. The timing is important to get the mixture to jell properly. Remove from heat, skim and pour into hot canning jars leaving 1/4 inch space per jar. Wipe jar rims and seal lids. Process for 10 minutes in a boiling water bath. Makes 6 1/2 pints of jelly. You can drink the juice of the prickly pear fruit in the pure state or extend it by adding it to water. To the brilliant color and subtler flavor you could add such things as carbonated water, honey, local citrus, tequila, creosote tincture, and/or sweetened lemonade water. Pour the agar agar into the fruit juice and mix and add the chopped fruit. If you want pure jelly, just skip the diced fruit. 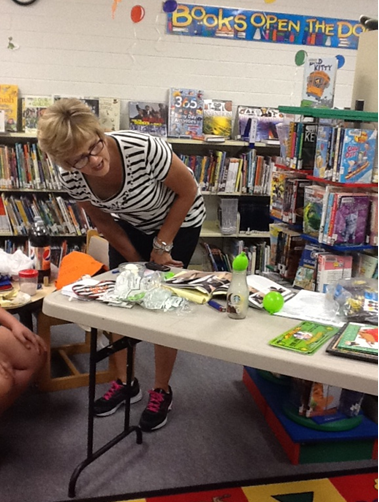 The September ladies tea party was actually a “Garden Party” with 14 ladies in attendance. 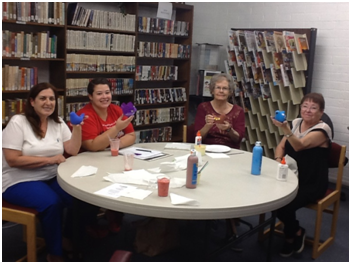 Unfortunately the pictures of the rest of the ladies didn’t turn out (sorry to those ladies), but here are Antonella Platt, Jenna Morrison, Linda Sullivan and Bev Servant holding up their finished bird planters. 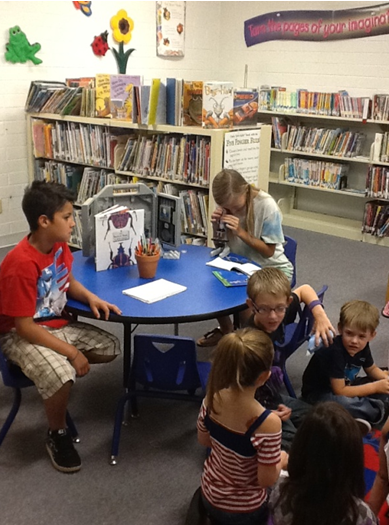 Next month’s October/Halloween tea party will be held on the 22nd. 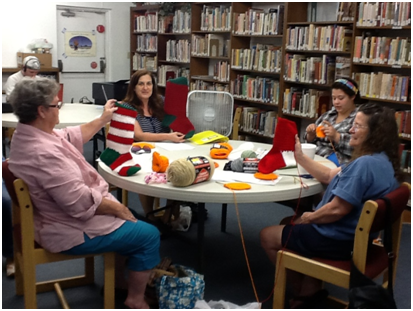 Did you know that the Kearny Public Library hosts a Crochet Club every Tuesday at 1:00pm? 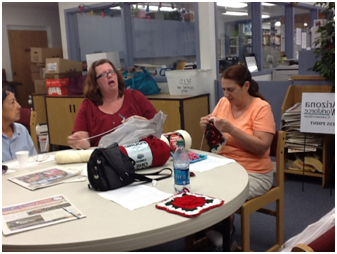 Here are some photos of our great crochet club in action! 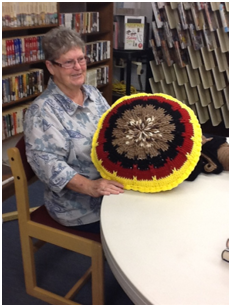 Frances Lease with her first completed project. almost finished Christmas Stockings. 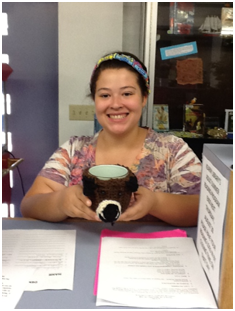 Jenna Morrison is working on her pumpkin potholder. 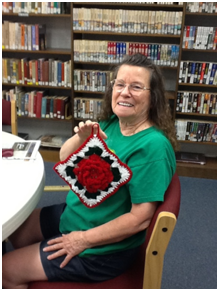 Wana Lundy with her finished rose potholder. 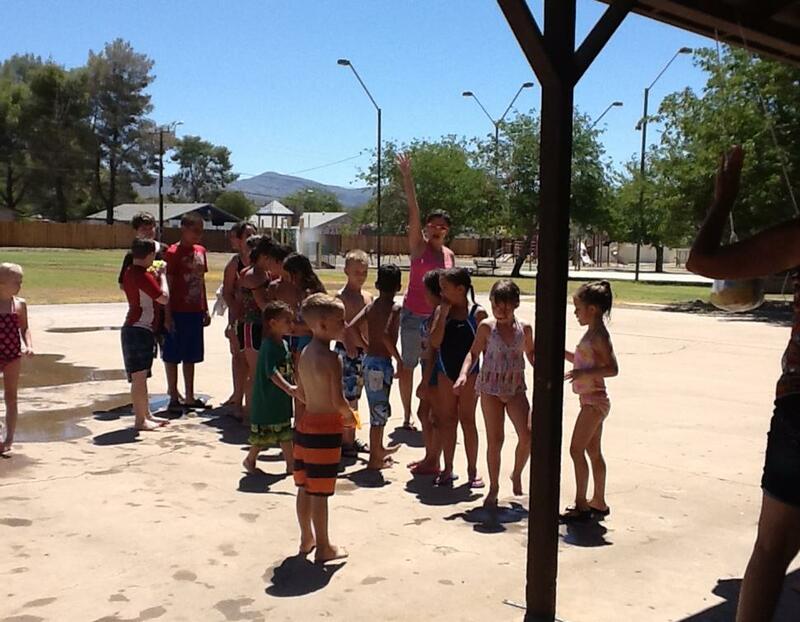 Kearny Public Library held its Summer Reading Program finale event, “Water Fun Day,” on June 26. 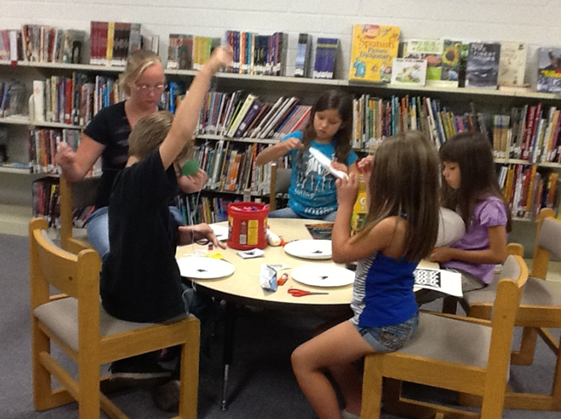 We had 20 attend, along with a number of adult helpers. 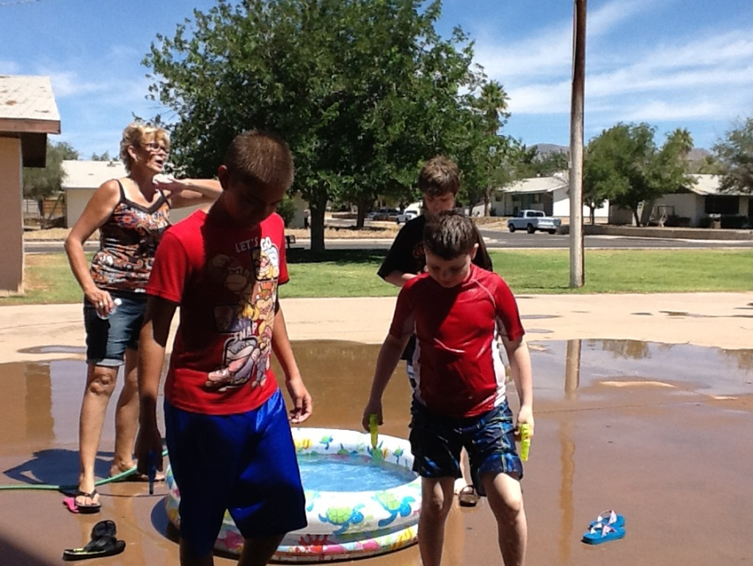 There were water games such as “Frozen Feet” where they had to pick up marbles with their toes while standing in ice filled water. 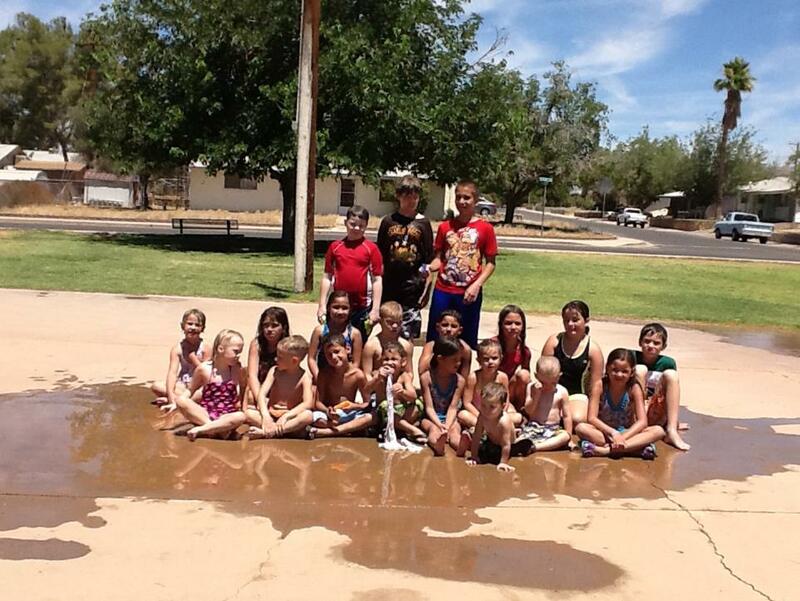 Additionally there was “Pinaqua” which was a water balloon filled “piñata”, playing in the sprinklers, as well as other water based games. 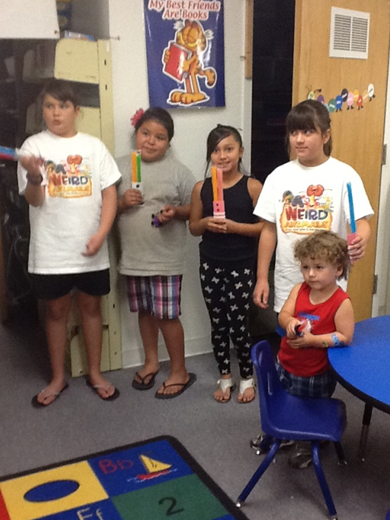 We finished off with pizza, ice cream, and rootbeer floats, while Library Assistant Vickie Lechuga handed out goodie bags to all the attendees and summer reading winners. 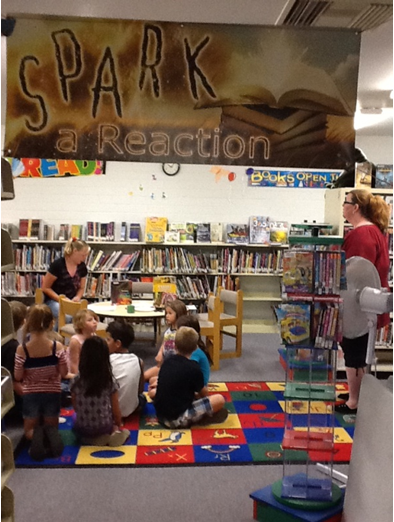 This year’s Summer Reading Program theme is “Fizz, Boom, Read” and emphasizes science and technology. 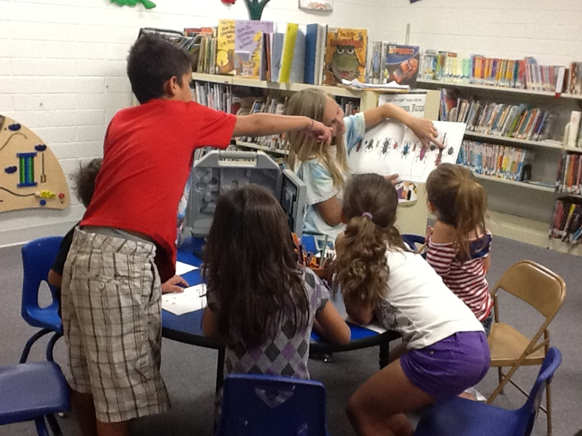 Here’s a photo gallery of the fun events going on right now at Kearny Public Library! 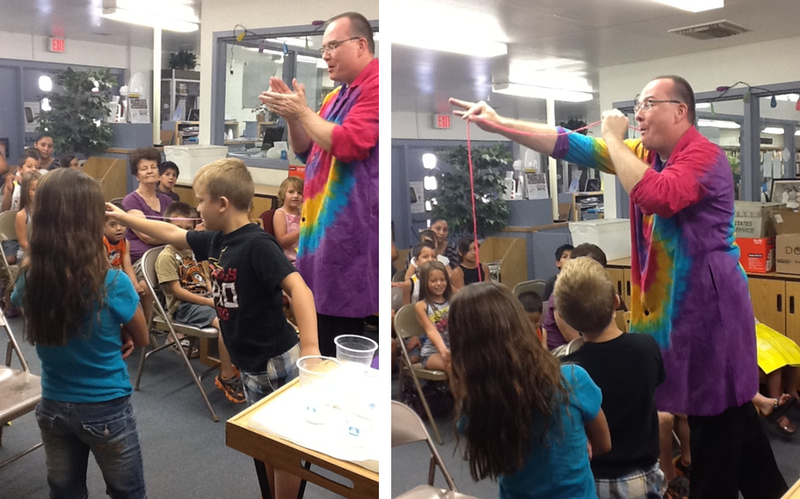 In the following images, our K through 3rd grade group attend a program learning about creepy, crawly bugs! 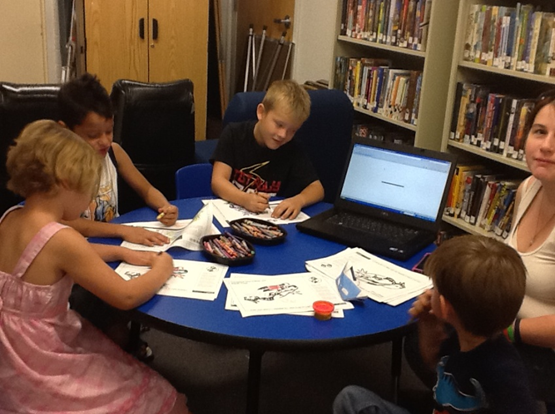 Kearny kids got to color bugs while listening to the sounds they make on the internet! 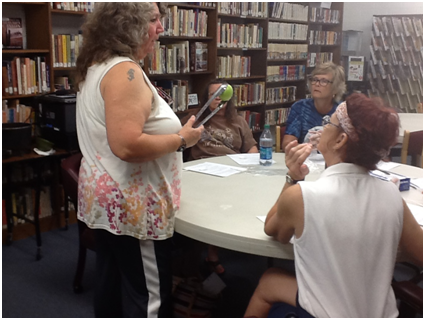 Here Library Assistant Vicki Lechuga performs as experiment about air pressure and physics in which a water balloon gets sucked into a jar containing a lighted piece of paper! Jeb Earl with two of his volunteer scientists. 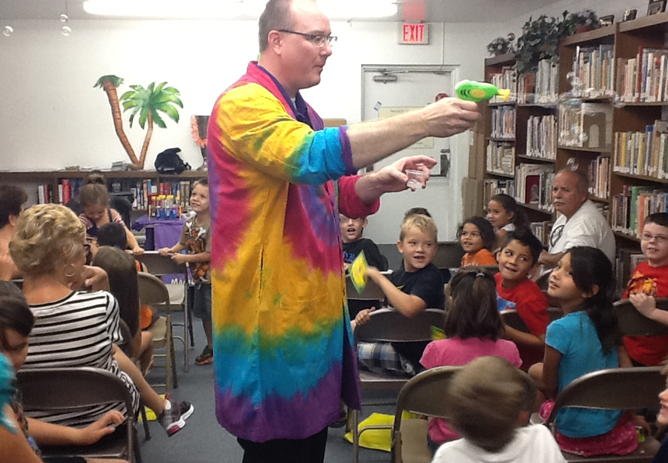 Magician Jeb Earl made a visit to the Kearny Public Library with a special science themed show in honor of this summer’s reading program theme: Fizz, Boom, Read. 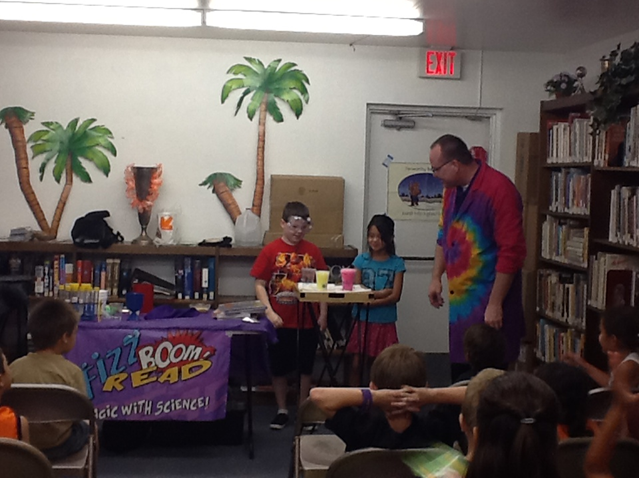 Incorporating science into a magic show kept the kids entertained while learning! 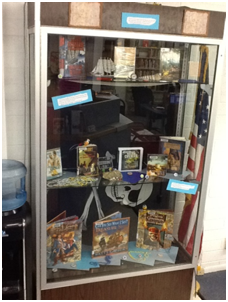 You can view Earl’s full Facebook photo album here. 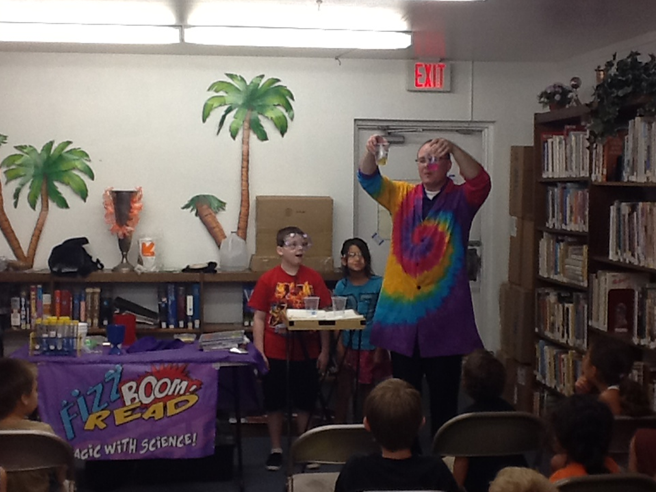 Earl demonstrating his un-burst-able bubbles! Who can stretch their bubble gum the farthest?